I wish there were a keyboard shortcut to toggle between those 2 viewing modes. how hard could that be to implement? is there a 3rd party program out there somewhere that will help me? It's not possible to change viewport parameters from plugin, now. It's what you want. Ctrl+NumpadNumber will save the currect scheme, then when you press the NumpadNumber it will load it. I got 3 set up: Textured Wireframe, Textured and Color Wireframe. B: Transparency and Anti-Aliasing, being the first more important. Having 100% opaque display makes no sense in most situations and forces you to go from Textured Wireframe to Textured, to see the surface better. \/ Attached an example of what Textured Wireframe should be more like. 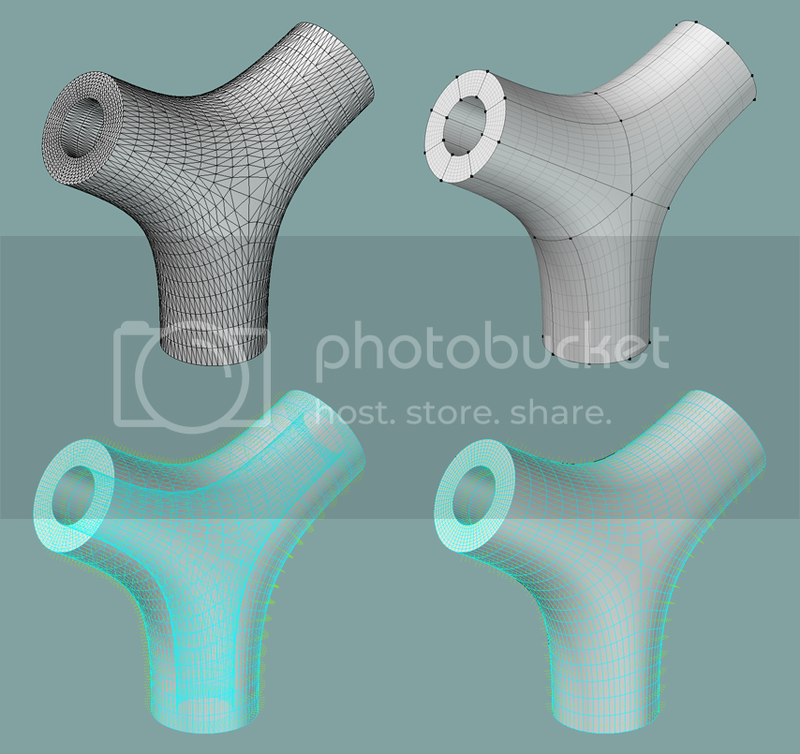 Object with texture, wireframe and vertices with different color and/or transparency. This way I can stick to one rendering style 99% of the time since I see it all of the front-face geometry. Last edited by probiner; 11-25-2011 at 05:13 PM. Especially in Layout should look like this. Currently Wireframe modes in Layout when there are sub-patches in object, is almost completely useless because of all these internal sub-patch lines showing thousands/millions triangles..
That's also true and has been pointed to be a visualization problem several times. Last edited by probiner; 11-25-2011 at 07:07 PM. A Catmull-Clark surface with some Edge Weight | Selection highlight. - Vertices display. LW hasn't a single viewport mode with Vertices and Edges display, plus shaded surface. - Wireframe Transparency. 100% opacity Wireframe forces one to turn it off to evaluate the surface. - When an item or it's elements are selected, only highlight the silhouette of items or just the Front Facing elements; NOT all elements in see-through. While it's useful many times, See-Through selection display can be an big mess. - Wireframe Anti-Aliasing. Sometimes a Screengrab is all you need and having wires with AA is great. Faked in my image by scaling down. A viewport behaving like this could be used like 90% of the time in modeler and layout (VPR aside), since vertices are seen, surface is not covered by edges and subdivisions and selections are visible but not a messy. Last edited by probiner; 03-15-2012 at 11:38 PM.